This is a typical weekend breakfast for us. Our local butcher has these house-made chicken sausages that are delightfully spiced with peppers and bell peppers. And I always make a cheese omelette (“Omelette du fromage!”), with lightly beaten egg, a dash of bitter lemon adobo and a generous helping of hard, young goat’s cheese. 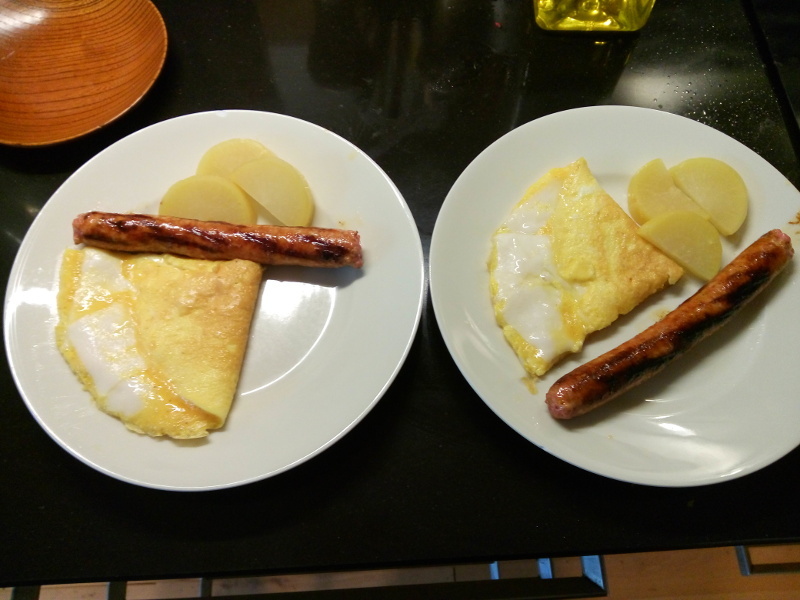 Normally I also bake a tomato along with the sausages, but we were out this morning, so I substituted slices of pickled daikon radish for that. A 'Continental' breakfast is so different to what I am used to here. It's nice to enjoy when I am abroad. I even made my own waffles when I was in Denmark last May! Any breakfast that involves frying something is quickly dubbed 'an English breakfast' over here. So if it isn't English and it isn't continental, I guess it must hover somewhere over the Channel or something? Very much so. I did ponder getting a waffle make for home, but it would no doubt be a novelty and the be consigned to the back of a cupboard. I would also be the size of a house in a very short space of time. That looks delicious. I'm not much of a breakfast eater but that looks tasty. In the weekends, we often lunch really late (as in, past 14:00), and this tides you over! On weekdays, breakfast is a bowl of cereal with milk, because lunch comes earlier (and it takes less time to prepare, because let's face it: who wants to get out of bed early?). That's what I call a great breakfast. Yum! yuuummmmmyyy. maybe a touch of salt? a little basil or oregano? I am the king of ready-made spice mixes. I cook a lot, but I couldn't season a dish from scratch to save my life. Indian curry? I'm getting a pot of curry pasta. Japanese curry? I've made it myself once, but I like the ready-made cubes better. Indonesian stew? I'm getting a bag of ready-made mix. So I whisk some bitter-orange adobo through the omelette: it has salt, pepper and other seasonings, and I'm done! Of course, the cheese adds some salt and a lot of taste as well, and it combines well. as a bachelor, i rely on my microwave for all cooking needs. All your cooking needs? I mean, it's less fun to cook for only yourself, but I manage by cooking larger portions and just dividing that up in portions. A microwave is only fit to re-heat things, I dislike things cooked in it. i typically snack on stuff that doesn't need to be heated, but for dinners i have healthy frozen dinners. and i buy whole cooked chickens and tear them to pieces and freeze them separately. THEN, i let them thaw in the fridge as i need them and tear them into small pieces that i put on my dinners after heating them in the microwave. but sometimes i just make salads and the only thing i have to heat up is the chicken i put in them. this is all probably more than you needed to know, but there it is. Ah, see: you're using your microwave to (re-)heat, and that's what it's really useful for. It looks like a lovely breakfast! I would choose a tomato over radishes too. Daikon doesn't have a particularly sharp taste though, and especially when it's pickled it's quite soft and almost sweet. So it goes well with just about anything. Here in the US, the standard at-home breakfast is usually just a bowl of cereal, but I'm trying to get away from that and fix myself a couple of eggs instead. Much better way to start the day. Well, during weekdays we have a bowl of cereal too, because it's too hard for us to get out of bed early enough to make it feasible to cook this on weekdays.